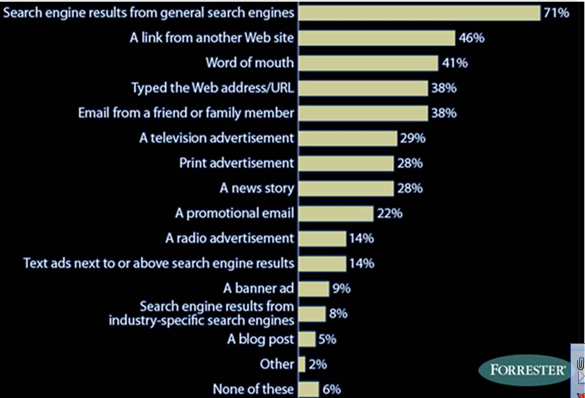 When surveyed the majority of people expect brands at the top of search engine results to be the leading brands on that chosen search term. It is therefore important to look across the entire broad range of search terms related to your business and build a plan for getting better visibility for the search terms that do not afford you that visibility. Despite the level of competition in search engine results there is always a sweet spot to aim for – a place where you are able to achieve good visibility for search terms that still have a good number of people searching on them but aren’t too competitive. With the increase in visibility comes and increase in visitors. This traffic can come from core generic search terms, or more likely from a broader mid range of search terms that are more specific to your brand and your unique selling points. Of course you need to give your potential visitors a reason to visit your website and there are factors around how you do this that will impact on search engine optimization. Once your visitors are on the site do they convert? Are they the right type of visitor? Have they found you because you have optimized your site for the right search terms? How long are they staying on the site for? Do they follow the right path through the site? Are there to many drop off points? Knowing how users interact with your brand on your website is crucial to success and again search engine optimization will impact on this. But the main reason that you need SEO is that everybody uses search. A lot of time can be sent profiling your customers and determining what content you should create and where you should place it, but with search you hit all of your customers all of the time.